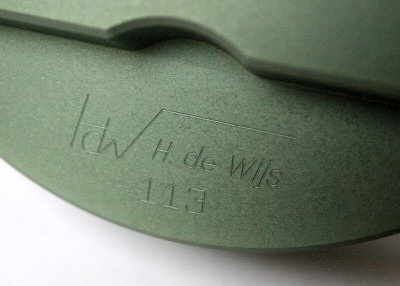 The first de Wijs viewer was manufactured in Holland in 1997 by the de Wijs Company. It was made from aluminium and had an impressive 8.2x magnification and also inter-ocular adjustment, allowing the user to alter the distance between the focusable lenses. The diffusers were made from glass and the viewer also featured a tripod stand. All de Wijs viewers had a unique serial number engraved into their body, the blue example shown below is number 60. A total of 50 viewers were manufactured in the initial production run in 1997. Of that run, numbers 1 to 5 were gold in colour and the remaining 45 were silver. The second and final production run occurred in 1999 when 63 viewers were produced in red(29), blue(18), black(12), green(2) and silver(2). The rarest colour is green, of which only two were ever produced.